Watch as Amma flips millet dosas without using any oil. Yes, folks, AskAmma goes live, inviting you into the kitchen on just another Friday morning, as she flips dosas in real time. This batter is made with a 1:1 ratio of proso millet and urad aka black gram or మినువులు. Be sure to use unpolished urad, with peel intact, whole or split. Remember: black gram should be black! This will give your batter a speckled gray color. Once you get a taste of this you will find white idlis and white dosas as white as white bread. 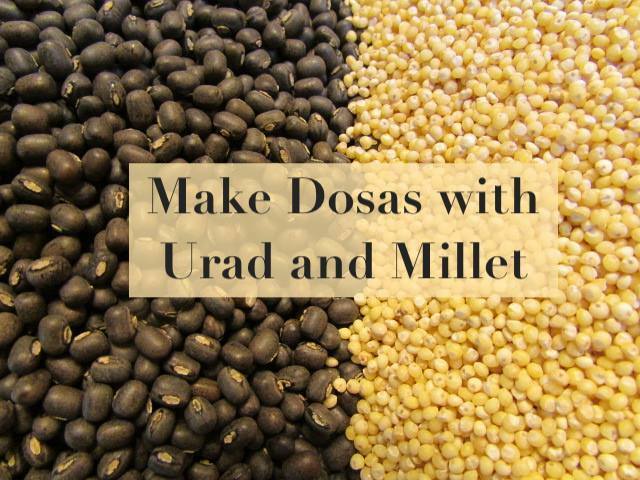 Note that in grocery stores in the US, proso millet is simply called “millet.” Urad or urad dal is available in Asian grocery stores. Whole black gram is called urad or మినువులు. Split back gram is called urad dal or మినపప్పు. As long as it is unpolished, you may use either one of these – keeping in mind that split black gram soaks faster than whole. To make the batter, soak the millet and urad for 8 hours, grind into a smooth batter and allow to rise in a warm place for 6-8 hours. Detailed instructions available at Proso Millet Idli andDosa . Hi, what are the hulled millets that we get us health food stores like Wholefoods and Sproits. The hulled millets in Wegman’s, While Foods, Sprouts and in most general grocery stores in the US are Proso Millet. If you are looking for any other kinds of millet, your options are as follows: Asian grocery stores often carry foxtail millet (korra), little millet (sama or sawa) or barnyard millet (moraiya). They also carry flour of finger millet (ragi), pearl millet (bajra) and great millet (jowar). Sometimes you can get puffed jowar as well. Animal feed stores and hardware stores that carry birdseed may stock other kind of millet, and they may be unhulled and not for human consumption.